As most people know, the area around Great Falls was first explored by Lewis and Clark on their famous westward expedition. Lewis and Clark during their expedition, which began in 1804, first encountered what is now known as the Great Falls of the Missouri in June of 1805. The Great Falls of the Missouri is a set of waterfalls that drop the Missouri River more than 500 vertical feet in less than 18 miles. Since the Lewis and Clark expedition was traveling by raft (the expedition was traveling upstream in rafts, moving by a combination of pulling from the shore and poling from the raft), these waterfalls presented a very formidable obstacle – all the more so since there was more than one of them. These waterfalls on the Missouri River proved to be such a major chore to get around that it took Lewis and Clark a month to move everything upstream above the last falls – just a scant 18 miles away. 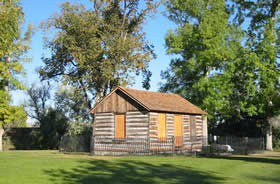 The Lewis and Clark expedition, though, didn’t spend any more time than it needed in the area which is now Great Falls. And by mid-July of 1805 they were gone, and wouldn’t be returning. And so the area that is now Great Falls sat pretty much as it was – undeveloped and uninhabited, with only the occasional passing trapper or mountain man making passing through the area. All this changed, though, during the 1880’s, with the arrival of Paris Gibson. Paris Gibson first came to Great Falls in 1880, and almost immediately began setting the foundation for a planned city. Gibson chose this place for a planned city as he recognized the areas potential to be a transportation hub and because of its close proximity to coal and other natural resources. It is especially important to note that Great Falls was a planned city – one reason it is so different from other Montana and western towns, particularly the boom and bust mining towns like Helena. Exacting detail was put into the plans for Great Falls, with everything from straight streets, minimum width of streets and the location of parks. Gibson, along with railroad magnate James Hill, spent considerable time in developing their city. And their work paid off very quickly – just four years later – Great Falls officially began settlement. By 1886, more than 1000 people lived in Great Falls, with numerous businesses located in town. The railroad arrived in Great Falls just one year later, allowing the vast agricultural potential of the area around Great Falls to be tapped. And, in 1888, a silver smelter was built along the Missouri River just outside of downtown Great Falls. Thus, by the 1890’s, Great Falls had literally went from a blank piece of prairie to a full fledged town with rail connection, numerous businesses, manufacturing industries and agricultural production. And, unlike a typical western boomtown, all the growth in Great Falls was planned. The 1890’s were equally kind of Great Falls. Electricity had only recently been developed. 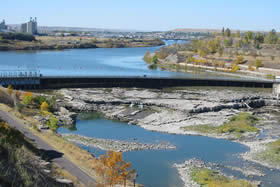 Gibson, recognizing the huge potential for hydroelectric power from the falls of the Missouri River, built the first dam on the Missouri at Black Eagle Falls, which is just outside downtown. Additional dams and hydropower plants were soon built. All this building of electric power plants earned Great Falls the nickname of “The Electric City”. Throughout the first half of the 20th century, Great Falls continued on a steady growth curve – not dying out like many boom and bust mining and cattle towns were throughout the west. While Great Falls was of course effected by the whims of the economy, its diverse economy allowed it to continue to grow – becoming the largest city in Montana by the late 1950’s – with a population of 55,000 people in the 1960 census. This steady growth in population was helped in part by World War II. Great Falls appealed to the War Department for an Air Force Base before World War II. Then, with the arrival of World War II, the air base plan become a reality as construction began on what was then known as East Base, which housed and trained bomber crews of the 2nd Air Force. East Base was continuously expanded throughout the war and after it, with the Strategic Air Command taking over the airbase in the 1950’s. In 1959, the name of East Base was changed to the name it has today – Malmstrom Air Force Base. And, beginning in the late 1950’s and lasting through today, Malmstrom also housed a significant number of nuclear missile silos. Yet, Great Falls would experience some bumpy time during the 1970’s and 1980’s. The closure of many resource extraction businesses, the leaving of several railroads and the general upheaval in agriculture all combined to put a lid on Great Falls growth during this time. Thus, when 1990 rolled around, Great Falls still only had a population of 55,000 people (while Billings had over 80,000 people by this time) – although some growth had occurred outside of Great Falls. The 1990’s saw some growth in Great Falls, with new industries coming to town, although many older manufacturing and resource extraction jobs disappeared. As such, the 1990’s saw Great Falls pretty much hold its own – ending with a population of 56,000 people in the 2000 census. Quite a bit of growth had also occurred outside of the official city limits. Need help finding your Great Falls MT dream home? Click here to Check out our experienced agents today, or submit your request online by clicking hereand we'll promptly get back to your request. Check out hot properties in Great Falls, MT or search properties from the entire area.